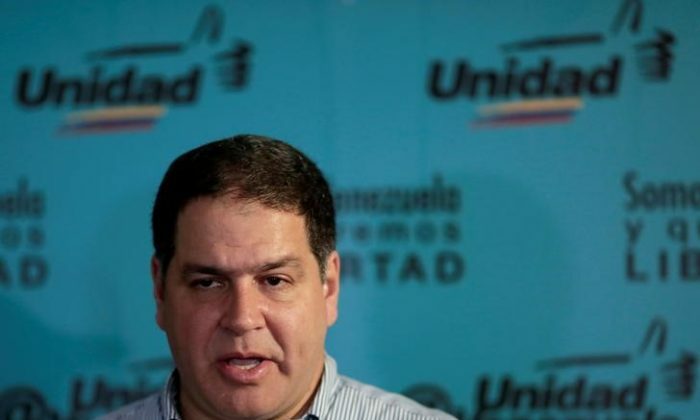 CARACAS—Venezuela’s opposition said on Tuesday, Nov. 14, that this week’s planned political dialogue with President Nicolas Maduro’s government in the Dominican Republic was being postponed because regional guarantors were not going. “The international negotiation process cannot go ahead until the foreign ministers are invited,” opposition negotiator Luis Florido said, referring to the potential presence of Latin American foreign ministers at the talks. Negotiations to ease a bitter and long-running political crisis in the OPEC nation had been scheduled for Wednesday. Previous dialogue efforts have ended in recriminations between the two sides with no concrete progress. The opposition coalition had previously accused the Maduro government of blocking the presence of foreign ministers at this week’s talks, but on Tuesday said it appeared to be more a scheduling problem. The opposition’s principal demand is for free and fair conditions for the 2018 presidential election. It also wants freedom for jailed activists, autonomy for the opposition-led Congress, and a foreign humanitarian aid corridor to help alleviate Venezuela’s unprecedented economic crisis. Maduro accuses his opponents of conspiring with the United States and a right-wing international campaign to oust his socialist government via a coup. The government is seeking guarantees against violence as well as recognition of the pro-Maduro Constituent Assembly that has overridden Congress. At least 125 people died in four months of often violent protests against Maduro earlier this year. Many Venezuelans and critics say he is a dictator who has wrecked a once-prosperous economy. Debt refinancing talks with international investors had begun successfully in Caracas on Monday, the government said, though creditors said the discussions were fruitless.